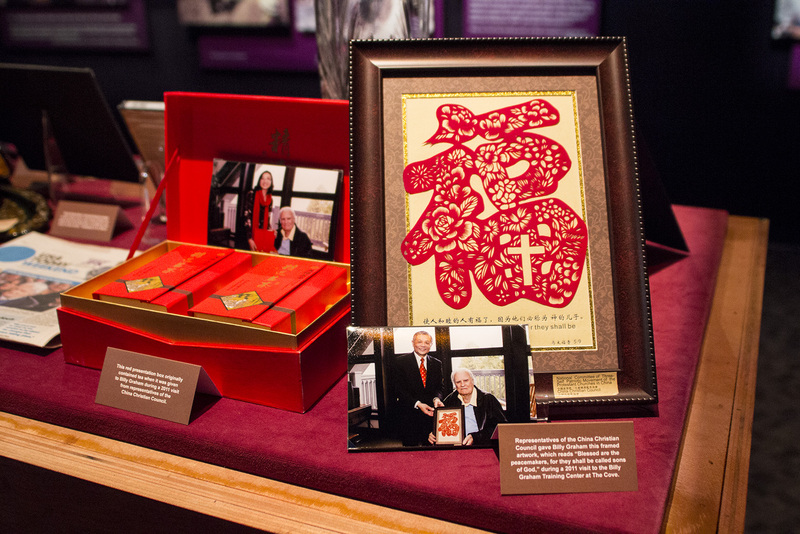 Throughout this year, you can find fascinating photos, memorabilia, and stories during 12 months of rotating special displays in The Journey of Faith tour. 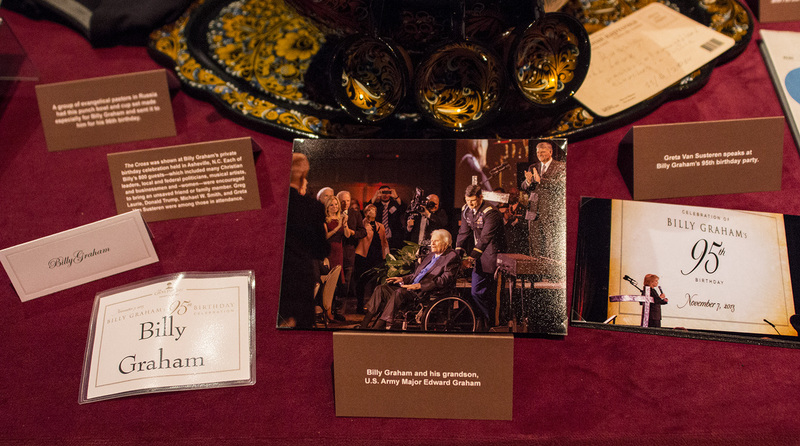 From September through October, our special display is titled “Looking to the Future” and focuses on Billy Graham’s life and ministry in the 2000s and 2010s. Enjoy this sneak peek of the new display. 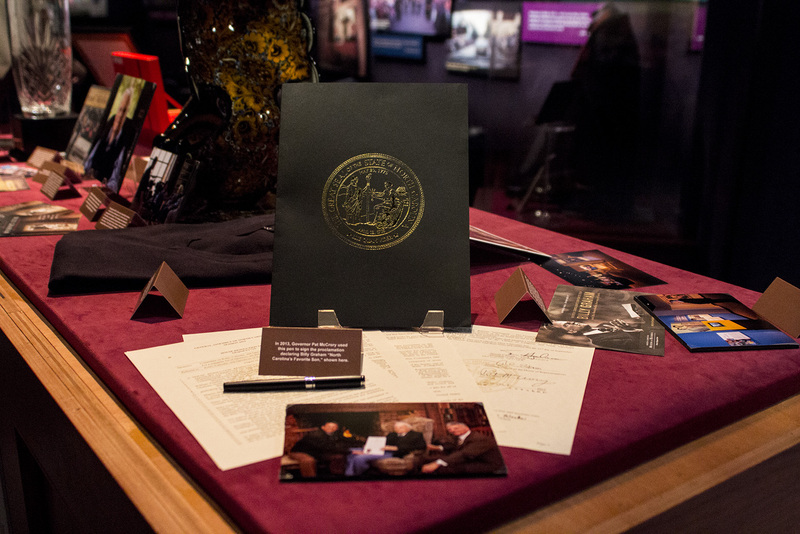 On December 6, 2001, Billy Graham was made an honorary knight by British Ambassador Sir Christopher Meyer at a ceremony in Washington, D.C. 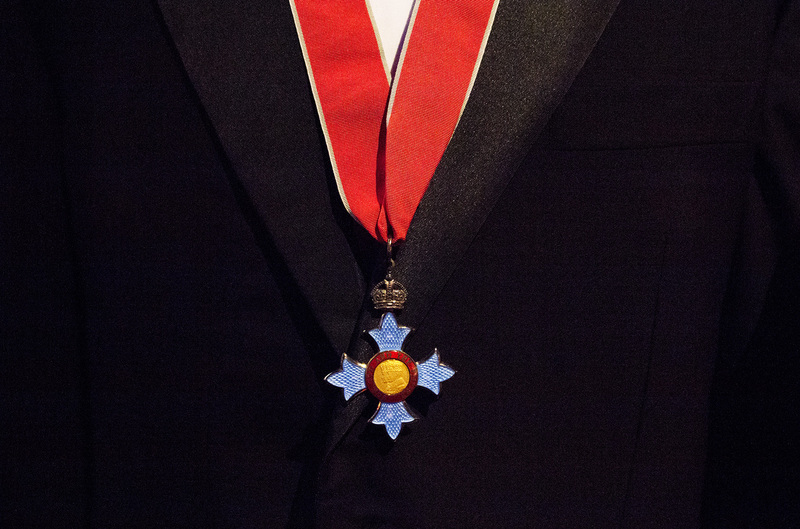 Above is his Honorary Knight Commander of the British Empire medal. 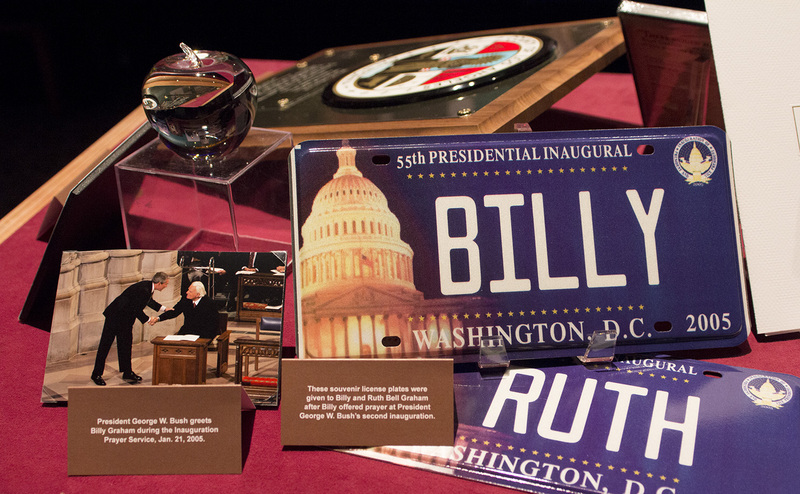 Above are two souvenir license plates give to Billy and Ruth Bell Graham after Billy offered prayer at President George W. Bush’s second inauguration in 2005. 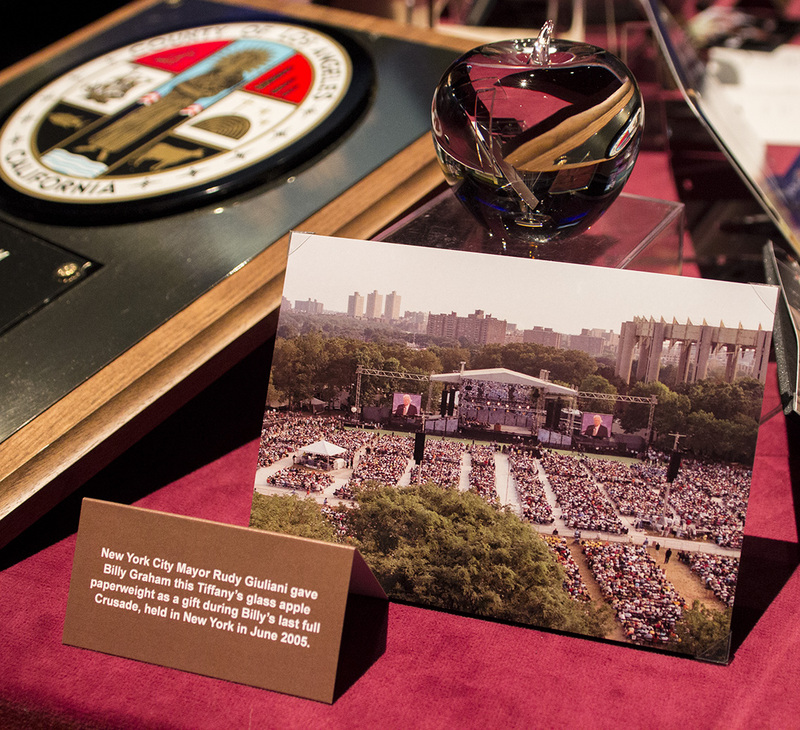 Above is a Tiffany’s glass apple paperweight – given to Mr. Graham during his last full Crusade in 2005. Ruth Bell Graham passed away at home on June 14, 2007, at the age of 87. A public funeral was held in Montreat, N.C., before Ruth was laid to rest in the Library’s Memorial Prayer Garden during a private interment service on June 17, 2017. 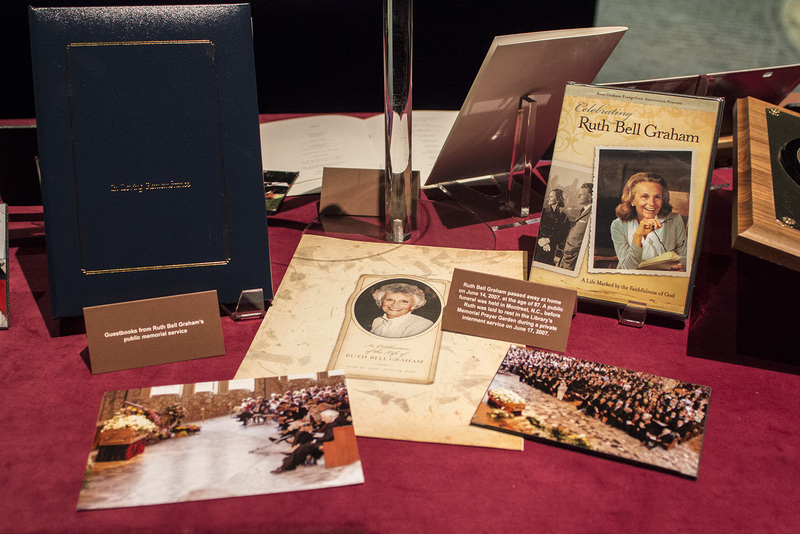 Memorabilia includes: a guest book from the funeral, funeral programs, and a DVD titled “Celebrating Ruth Bell Graham” and more. After 9/11, staff from the Billy Graham Evangelistic Association and Samaritan’s Purse flew into New York City to minister to people impacted by the attacks. 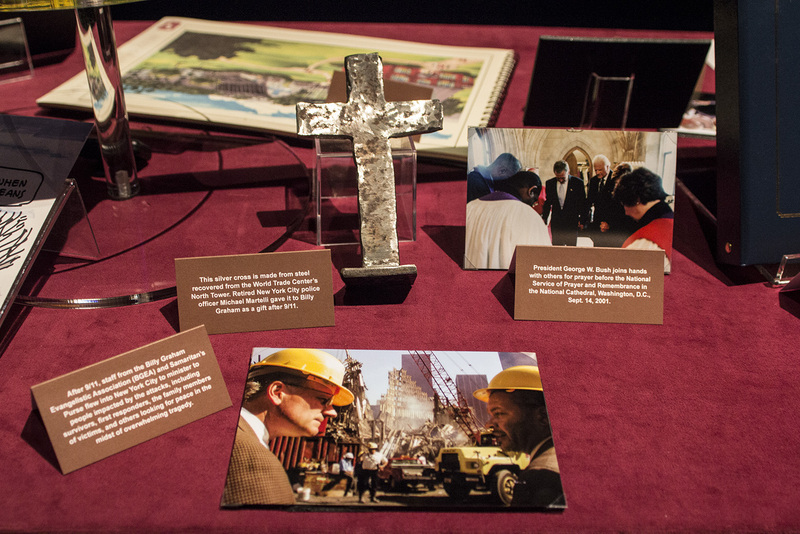 Above is a cross made from steel recovered from the World Trade Center’s North Tower. In 2013, Governor Pat McCrory presented Billy Graham with this proclamation declaring him the “The Favorite Son” of North Carolina. Above you will see photos from Billy Graham’s private 95th birthday celebration held in Asheville, N.C. on Nov. 7, 2013. Plan your visit to see the “Looking to the Future” display today. Wonderful tribute to Billy and Ruth. Thank you for preparing and sharing these honoring and interesting memories, photos and artifacts with all of us who love and owe them so much. I’m coming to Wilmington, NC as a chaplain with a small TN disaster relief team from First Baptist Church. I plan to come back through Charlotte, and hope to visit The Library for my first time. Can’t wait to see it. God Bless all of you.